Siemens Dishwashers are designed to save you time and effort in the kitchen. Each Siemens Dishwasher delivers stunning results even on the most economical settings. After preparing a big meal, the last thing you want to do is spend more time in the kitchen washing dishes. When you’re finished eating, load up your Siemens dishwasher and take a well-earned break. Meal times are less of a chore when you’ve got a Siemens dishwasher to do the hard work and take care of all your dirty pans, plates and bowls. Siemens Dishwashers are efficient and they look good too, so you don’t have to worry about them slotting into your carefully chosen kitchen design. The range features plenty of different styles including full-size, integrated and slimline versions, and you can choose between a number of finishes such as a classic white or classy silver. If you can’t find a Siemens washing machine to match your budget or specific needs, take a look at our full range of Hotpoint dishwashers and you’re bound to see something suitable. 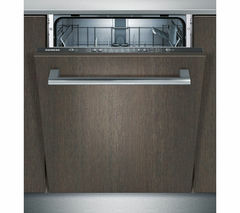 And if you’re looking for a luxury dishwasher, try a Beko Dishwasher. Siemens dishwashers are ideal if you want to spend less time on your chores in the kitchen.